Due to my increased level of exercising, I get hungry very often recently. When I get hungry, I crave carbs. I would eat so much bread, pasta, and rice that it's scary. However, to really subside the hunger, protein is the answer. Unfortunately, I'm not much of a meat eater. More accurately, I have no problem with eating meat...I just don't cook meat if given a choice. This means eggs are my friend, my very trusty good friend. I love hard-boiled or soft-boiled eggs. Unlike scrambled eggs or fried eggs, just one and it is enough to be quite filling. It is egg at its purest. I like them plain without any salt or seasoning. Without the need for any supervision, it is dead simple to make. I don't even need oil for cooking! This is my prefer way to enjoy eggs for breakfast (or anytime of the day, for that matter). According to the Egg Farmer Association in Canada, eating an egg for breakfast is a great way to curb mid-afternoon snacking because of the staying power of protein. I think I should get back in the habit of eating a boiled egg a few days per week. My current diet is sort of messed up with too much emphasis on carbs, fruits, vegetables, and legumes. The website also mentioned that eggs are complete protein meaning they contain all 9 amino acids. I think it would be a great supplement to my current diet to make it more balance. Our party ordered quite a variety of dishes from the menu. However, I would stick with reporting only on the dishes that I tasted. House Smoked Whitefish Crepe served with Crushed Fava Beans and Wild Leeks: I liked the constrast of the slightly sweet crepe against the smokiness of the whitefish. Besides, they have a surprisingly similar texture that was delicious. Galantine of Quail and Rabbit Liver served with Haricots Vert dressed in Dijonnaise: This dish brought me back to Paris! The round of creamy liver and gamey quail meat was tightly bounded by cauled fat. It was sooo tasty with just the right balance of rich and lean. Whether I spreaded it on the thin toasted baguette slices or ate it by the forkful, it was a joy to devour. The haricots vert were just that little bit crunchy and picked up the Dijonnaise dressing nicely. Smoked Veal Cheeks served with Peas and Green Garlic in Manchego Broth: Such a tender piece of meat! I love tete de veau for the gelatinous property that the dish typically imparts. This smoked veal cheeks certainly shares this trait. The manchego broth was hearty but the richness was cut by the fresh sweet peas. I ate every last drop of the broth with the spoon. Would be so nice to have some crusty sourdough bread to mop up the broth. Roasted Scallops served with Swiss Chard, Saffron Mussel Soup: The scallops were smaller than I expected but they were very sweet. I adored the caramelization all over the sides of the each scallop. It added much complexity in flavour to the natural sweetness of the scallops. Selection of 3 Cheeses served with Pear Jam, Candied Walnuts, and Toasted Baguette: From a cheeseboard filled with 6 or 7 different cheeses, I chose an ash-covered goat cheese from Valencay, and two Spanish cheeses whose name escaped me. I'm not a cheese-expert though I'm a cheese-lover. I thoroughly enjoyed this course both for the distinctive tastes each cheese selection contributed and the way that this course was presented. First, the cheese were served at room temperature for the best flavour and texture. Secondly, our waiter gave a good introduction for each cheese including the place of origin, flavour profile, and what kind of milk it was made with (cow, sheep, goat). Nicely done. The service at Niagara Street cafe was efficient and friendly. However, it was the waiters' knowledge on the menu which left the deepest impression. We asked them all kinds of questions including who made their bread, the ingredients used for a vinaigrette, what was used to hold the galantine together, and availability of tasting menu. Our waiters calmly answered all of our questions (correctly, I may add) without needing to rush back to the kitchen to ask the chef. By Toronto standard, I was very impressed. This is probably one of the best-value cafe/bistro in Toronto. The classical approach to cuisine and the excellent execution of great comfort food remind me of my dining experience at Le Comptoir (here and here) in Paris. Between the five of us, we tried most of the dishes on the menu and we agreed that most of the dishes were top notch. The thing that really won me over was their great selection of cheese for the cheese course. Not only was our waiter knowledgeable on the menu, he also gave us a lively overview of the different cheeses available and their characteristics. For those who don't like dessert, having such a nicely done cheese course as an alternative or additional to the dessert course is great idea. Finally! We have a proper dessert cafe in Toronto thanks to the great folks at Dessert Trends. I attempted to visit a couple of weeks ago in my last dessert walking tour but by the time I arrived, the cafe was already closed. I was much better informed last Saturday and had some great nosh in DT Patisserie-Bistro. First thing first, hot chocolate. The hot chocolate at DT Patisserie-Bistro is made european-style with a bittersweet chocolate ganache thinned with skim milk. As much as I love the intensity of the spicy chocolate shots at SOMA, it doesn't quite satisfy my craving for chocolat chaud like the ones available in Parisian cafes. This hot chocolate is rich, smooth, and deeply chocolatey. I think for the time being, the debate for best hot chocolate in Toronto is settled! The signature look of mousse cakes at Dessert Trends is easily recognizable with its chocolate egg-shaped shell neatly encasing the airy mousse and cake. I ordered the passionfruit mousse cake in white chocolate shell. The cake was beautifully plated with tart passionfruit coulis and colourful mixed berries. I love the whimsical look of this cake. With the white chocolate shell, cream-colour mousse, and a swirly dot of bright yellow passionfruit centre, this mousse cake looks like a giant soft-boiled egg. I also enjoyed an almond croissant at my last visit. The croissant was very buttery and the almond filling was generous and delicious. However, it was not as light and flaky as Thuet's. There are so many other items on the menu that tickles my interest. The tiramisu here is very famous and the fruit tarts look so enticing. There were also the croissant puddings (like bread pudding but made with croissant) in cute little ramekins. Other than the sweet menu, the savory items look great as well. Their weekend specials included croque monsieur/madame...well, I can't say no to a great grilled cheese sandwich! I'm looking forward to revisit DT Patisserie-Bistro in near future. P.S. I originally had lots of beautiful pictures taken but unfortunately, they are now all gone when my digital camera was stolen later that afternoon. When AL consoled me yesterday that perhaps my bag will be returned, I did not believe him for even one second. As much as I'm shaken up by this theft and question my own safety living in this city, I must admit that good people far outnumber the bad. I was standing by my car totally stunned when I first discovered that it was broken into. Without my phone nor my wallet, I did not know what to do. Fortunately, three very kind people came up to me and offered their assistance. They offered me practical suggestions, lended me the use of a mobile phone, helped me to clean up the broken pieces of glass, and most importantly, their very presence calmed me down. As I was about to drive off, they gave me a few quarters for phone calls, made sure that I had enough gas to get home, and gave me a can of iced-tea seeing that the thief even took my water bottle. Their kindness in my time of need is very much appreciated. I was cleaning up my room all day today since I did not feel comfortable to go out. As paranoia typically goes, my mind was racing with all sorts of worst-case scenario as a consequence of yesterday's theft. Out of the blue, my good friend AL (that's another AL) called me and asked if I lost my phone because she received a call from someone claiming to have my belongings. I was ecstatic to hear this news and quickly made arrangements to pick up my bag. Just as the police officer and AL predicted, the thief only took the valuables and threw my bag away. A couple of good people happened upon my bag during work, took it back, and eventually got in contact with me. All of my irreplaceable items remain intact. As for the things that the thief stole, although they cost quite a bit, they are things that I can purchase again except for my change purse which was a birthday gift from my brother. However, at this point, I'm just thankful that all of my other sentimental belongings are now home, safe and sound. Thank you, good samaritans! You cannot imagine how much your assistance means to me. I originally had a wonderful report on eating on Harbord St prepared for today. I had such delicious food at DT Patisserie & Bistro, Harbord Bakery, and Harbord St Fish & Chips. Unfortunately, I was target for theft later this afternoon in another part of the city which costed me my digital camera, among other things. Besides being angry, I am also very scare right now. This happened in broad daylight in a high traffic area. It's not even one of the more dubious neighbourhoods around the city. I was vigilant yet apparently I was spied on and the theft was planned. If it could happen like this, anything could happen. I fear for my own safety. I am in no mood to write now. The inside of my car is filled with broken pieces of glass and the thief stole some of my belongings which have special meaning to me. The things I miss the most aren't even expensive. They were given to me by people that I love but have passed away since. These things are absolutely irreplaceable. I hope that I'll be back to my cheery self in a few days. I love a bowl of hot cereal for breakfast but I'm typically too lazy to make oatmeal. What about instant oatmeal, you say? I actually have a strong dislike for those because 1) they're sugary 2) they're nowhere near how oatmeal is suppose to taste like. Since I've discovered such instant hot cereal as cream of wheat and oat bran a few months ago, I've been enjoying these to my heart's content. To make a bowl of hot cereal less boring, I like to replace the water with skim milk and throw in handfuls of dried fruit or nuts. Sometimes when I really crave sugar, I would sweeten the cereal with some lavender honey. However, my recent favourite variation tops all of those. 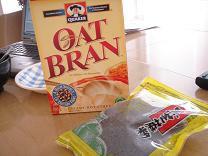 I like to make the cereal with half oat bran and half grinded toasted black sesame. The sesame powder can be purchased at some Chinese grocery stores. 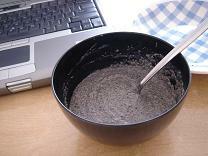 Mind you, this is not the instant black sesame dessert soup mix. Those are loaded with corn starch and sugar. The sesame powder that I use is 100% sesame. This is even more delicious if made with soy milk. The cereal is fragrant and absolutely nutritious. Most of the menu items are priced under $12 and are good sizes for sharing between four for tasting. Of course, for some of the dishes that I liked best, I would love to have the whole dish to myself! bread with fresh cheese and olives: the slices of baguette were drizzled with a bit of olive oil but the wedge of mild-flavour fresh cheese is the reason to order this dish. Combined with the saltiness of the olives, it was something good to munch on when deciding what to order. arugula salad with machego cheese and toasted almonds: a lightly-dressed salad with a slightly sweet vinaigrette. The machego cheese was quite tasty and complemented the peppery taste of the arugula. jamon serrano with fruit compote: the paper-thin slices of ham was much sweeter than I expected. Combined with the sweetness of the fruist compote, the whole dish did not have the salty punch that I was hoping for. fish ceviche with yams and corn (toasted and fresh): One of my favourite dishes of the evening. This was a "salad" of fish ceviche pieces tossed with slivers of onion, chopped cilantro, red peppers, fresh and toasted corn kernels on rounds of steamed yams. The fish tasted fresh and refreshing from the citrus treatment. The toasted and fresh corn kernels provided very interesting textural contrast. Oh, and the yams! Their natural sweetness and starchiness was so good. smoked trout with fingerling potato and avocado: This dish was very similar in concept to the fish ceviche except that the quenelle of avocado dip introduced a creamy component. However, personally I did not think the richness of the avocado worked too well with the lightly smoky flavour of the trout. octopus terrine with cherry tomato and capers salad: This was another favourite of mine. The triangle slice of octopus terrine was exactly the reason why I love this sea creature: a little chewy and so full of flavour. Besides, it was beautiful to behold with its profile of circles after circles of tentacles tightly packed together in creamy white and dark purple. The accompanying red and yellow cherry tomato salad with capers was good too. No siree, bland watery tomatos need not apply. These little globes were appropriately sweet and tart. lamb loaf with eggplant: This was essentially a meat loaf given the middle-eastern treatment. The saffron-hued sauce was thick from the eggplant puree but surprisingly sweet with a subtle tint of anise. The two slices of lamb loaf were very tender but did not taste too "lamby". Would be good if served with slices of flatbread though. kingfish with sauce basquise: I was very skeptical when this dish arrived at the table. The fillet looked grey and absolutely overcooked that I seriously considered sending it back. However, upon tasting, it was still quite tender though I was not exactly overwhelmed. The sauce basquise was a mixture of tomato and sweet red pepper. Again, sweetness ruled in this kitchen. braised beef cheek and tongue with lima beans: With its clear broth, this dish reminded me of a summer version of pot au feu. Both the tongue and cheek (heehee) were very tender though a little lacking in flavour. piquillo peppers stuffed with salted cod on tapenade: stuffed piquillo peppers seem to be the de riguer dish around Toronto right now. I recently had them at Cava and spotted them at quite a few restaurants as well (especially tapas-style eatery and wine bars). Torito's version was not particularly outstanding but the addition of salty tapenade rised this dish above the ordinary. Service was attentive although it appeared a little disorganized at times. When we arrived, we wanted a table at the busy patio. Since there were only 2-people tables available, a server seated us at the bar with menus to whet our appetite while he rearranged the tables to make room for us. Between the numerous waiters who served us, they must have asked us how we liked the meal at least three times in the evening. Not much to complain about the service. With so many new restaurants in Toronto boasting tapas-style dining, distinguishing yourself can be difficult at times. Most of the dishes we had this evening were enjoyable although only a couple were truly memorable. However, given the relaxing atmosphere at the intimate patio, I would say it was a very positive experience overall. Probably not for special occasions, however, Torito is a great place for a casual dinner with a few friends. After skating in Hamilton on Sunday, I got back in town before 11 o'clock (aka brunch time). Since I heard some good things about Czehoski's brunch, I decided to give it a try. It was not busy when I arrived and I had the whole patio to myself. Although the restaurant started to quickly fill up, I was surprise that nobody chose to have their meals in the patio except for me. No matter because it was a gorgeous little sanctuary that I thoroughly enjoyed. I had the eggs benedict with unpasturized brie on Thuet croissant. It was served with a side of lightly-dressed green salad. I also had a glass of freshly squeezed orange juice. Though not outstanding, the food was definitely delicious. I really wished that I brought my camera with me so I could capture the beauty of the quiet patio. It was a tasty reward for a morning of exercising. Coconut tapioca dessert soup is a popular dessert soup in Cantonese cuisine. The most popular flavours are taro or honeydew melon. However, this no-cook dessert soup is the perfect vehicle to match with many different fruit flavours but the key is to use lots of fruit puree. This is my variation on the recipe passed down to me by my Mom. It is inspired by Pierre Herme's Ispahan (raspberry, lychee, rose). In a medium saucepan, fill with water and simple syrup in a 50:50 ratio until you have half a pot of liquid. Bring the liquid to a boil and put tapioca into the pan. Close the lid and remove from heat. Let the tapioca soak until the pearls are transparent. Drain the tapioca and set aside. In a very large mixing bowl, mix the remaining ingredients together. Adjust sweetness with simple syrup. Stir in tapioca and store in refrigerator. I've always wanted a pink folding canvas chair. It's the only reason why I've been holding out on this purchase because all I could find was chairs in black, beige, red, and blue. I was shopping at Sporting Life today and spotted a very pink butterfly folding chair as part of their Hello Kitty display. A few enquiries later and the chair was placed in front of me in clear view. Unfortunately, it's not only pink, it's a pink Hello Kitty folding chair...you can't possibly miss the huge Hello Kitty in the center of the chair. I couldn't quite decide if I want to buy the chair. After all, I'm not much of a Hello Kitty fan. BUT (and that's one big but), I've been looking for a pink chair all these years to no avail. Besides, who would see the logo anyway when I'm sitting in the chair? Okay, so the chair came home with me. 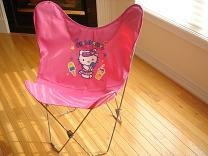 Next time when I'm out at the baseball diamond or a regatta or inline practice, I will be easily recognizable as the girl who's a little too old to own a pink Hello Kitty chair. Don't forget to say hi.